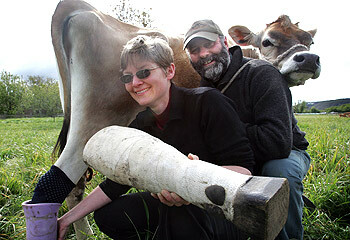 A prized dairy cow is putting her best foot forward again after an Australian-first effort to fit a prosthetic limb. Latrobe dairy farmer Geoff Heazlewood admits it was just a whim when he suggested Theresa, a two-year-old heifer, get an artificial leg. But the response to the throw-away line on ABC Radio’s Country Hour has amazed Mr Heazlewood and his wife Anne. Last weekend Theresa was fitted with a new leg, just three months after one of her rear legs was amputated after a fall down an embankment. It followed offers from four people with experience in making prosthetics, including Launceston’s Charmaine Gooding who made and fitted the limb. “She volunteered her time but gave us no guarantees, did some work and that’s where we are at now,” Mr Heazlewood said. A week after fitting the artificial leg, made of timber and fibreglass, everything is going well. Mr Heazlewood said the cow seemed to take a few minutes to get used to the new leg, but had adjusted fairly well.